Posted on 27, December 2017 by EuropaWire PR Editors | This entry was posted in Energy, Gas & Oil, Finland, Industrial, Transportation & Logistics and tagged Cato Esperø, Hallvard Klepsvik, North Sea Shipping AS, offshore supply vessel, vessel operations., Wärtsilä, world’s first energy storage solution. Bookmark the permalink. Caption: The retrofit energy storage system improves the operational efficiency and environmental footprint of the North Sea Giant. HELSINKI, 27-Dec-2017 — /EuropaWire/ — The technology group Wärtsilä has agreed to retrofit the world’s first energy storage solution on board a large offshore supply vessel. The North Sea Giant, one of the world’s largest and most advanced subsea construction vessels, will be fitted with an energy storage system that reduces the vessel’s energy consumption, operating costs and exhaust emissions. 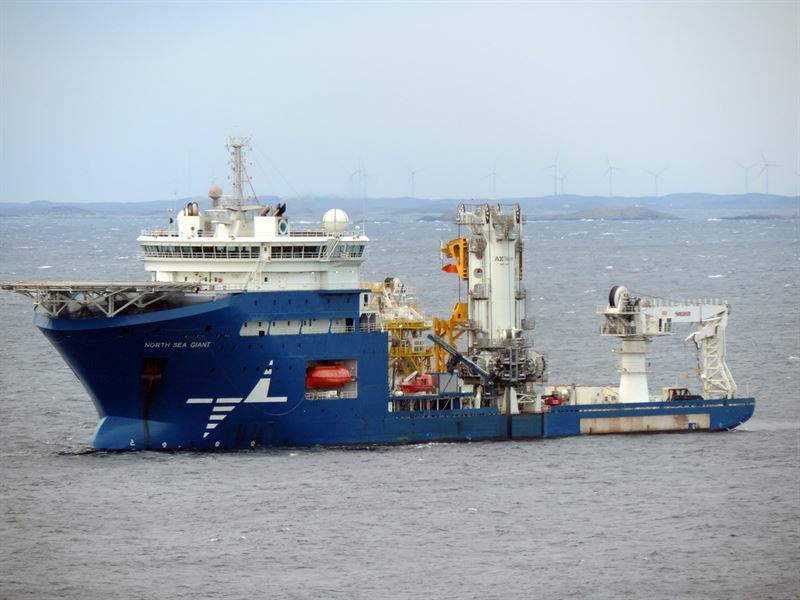 The retrofit energy storage system improves the operational efficiency and environmental footprint of the North Sea Giant, responding to key requirements of Norwegian North Sea Shipping AS, the owner of the vessel. The solution provides power redundancy and increases responsiveness of vessel operations. Typically, a vessel with dynamic positioning uses two or more engines simultaneously to secure back-up power. This means that the engines’ load run low. By using a hybrid/battery system to provide the needed back-up power, the operational engine can be used closer to its optimal load. In addition to the hybrid/battery solution, the agreement signed in August 2017 includes transformers, filters, switchboard, shore connection equipment, upgrades of existing components and commissioning. “For us is it important to reduce environmental emissions and modernise the vessel to make it more competitive. In addition, with a more efficient vessel, we will save fuel expenses. The estimated reduction in emissions is 5.5 million kg CO2, 30 tons of NOx and 1,200 kg SOx per year. After Wärtsilä had retrofitted our ship Atlantic Guardian in 2014, we really understood how much fuel can be saved by improving the vessel’s efficiency. Efficiency also saves time, because you only need to refuel every second or third port visit,” says CEO Hallvard Klepsvik, North Sea Shipping AS. The North Sea Giant is a DP3 vessel. The ship is listed in the most advanced category of vessels that apply dynamic positioning. Installation of an energy storage solution into a class DP3 vessel has never been carried out before and requires a redefinition of applicable classification rules. Therefore Wärtsilä and North Sea Shipping AS are working in close collaboration with the DNV-GL classification society. North Sea Shipping AS owns, operates and provides management services for advanced offshore supply vessels. Based in Austevoll on the west coast of Norway, the company has extensive experience in offshore shipping. “Wärtsilä has gained a high competence on hybrid projects on many different vessel types, and has a close relationship with the customers. For this reason, we are able to test new technology on many different types of vessels. We are the first in the world to work with hybrid systems on bigger vessels such as the DP3 classified North Sea Giant, and the project will set a new standard for this type of vessels,” says Cato Esperø, Director Sales Norway, Wärtsilä.